Troldstuerne (The Troll Chambers") in Odsherred is a double passage grave. 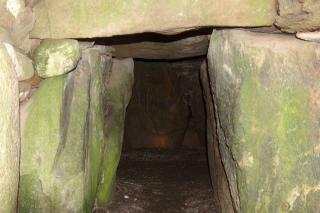 The two burial chambers date back to the Neolithic period, around 5,200 years ago. We know that in 1756 one of the chambers was in use as a pigsty with access through a hole in the wall. The second chamber was unopened until an archaeological dig in 1909. Flint axes, earthenware vessels, amber beads, arrow tips and flint daggers tell us that the passage grave was used in two Neolithic periods with an interval of 1,000 years. On the floor in the two separate passages to the chambers were numerous skeletons. The floors in the chambers and passages were covered in slabs of white limestone. " " Duality is a common feature of barrows and passage graves; hence the term 'twin' or 'double' passage grave. The two chambers in Troldstuerne are mirror images of each other either side of a central axis. The two chambers with their own entrances are thus twinned. Duality is also seen in the twin stones found in some of the graves. These are two halves of the same slab of stone, typically forming the wall of the stone chambers. The two halves are usually set facing each other or side-by-side as capstones. The significance of this is unknown. Perhaps the builders wanted to express some form of alliance between themselves and the gods. "